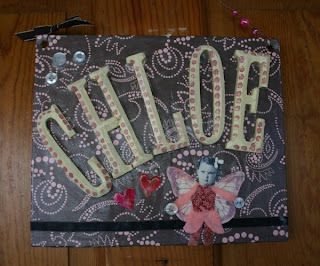 I made this plaque as a shower gift for my sister- in-law when my niece was born. It made from foam core board covered with patterned paper and then elements Mod Podged on top. 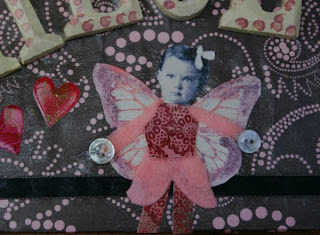 The fairy is made from felt and patterned paper with buttons for hands and stamped wings with Distress Stickles added to them. The face is an old picture of my grandmother, Chloe's great-grandmother. 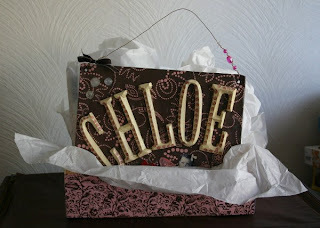 The gift box is a Clementine crate decoupaged with coordinated patterned paper. I can't believe my beautiful niece is almost one year old! Love the fairy ~ so sweet. What a great gift. A keepsake, for sure!